This fall, I came across a wonderful series called 25 Days of Art on the blog In the Children's Room. In particular, the post on Building Squares caught my eye. AHA! Cheap, easy, and creative is just what I need our Afterschool crafts to be and this fit the bill perfectly. We needed around 300 sets to take with us on our Afterschool outreach because we wanted each child to be able to keep their set. Cardboard is an abundant commodity here and it really cost us nothing but time and effort (which was mostly volunteered). We bundled them up in sets of 15, held together with a rubber band for distribution. Yes, that was a lot of pieces. Yes, we started cutting months ago. But, of course, you don't need to let your kids keep their sets if you're limited in time or resources. The kids have loved having these sets and they were really excited to have something to take home with them. 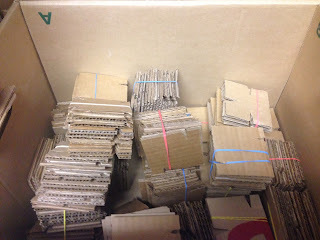 We pointed out to them that if they want to extend their sets, they can easily create more (save the box next time you order pizza, save your cereal boxes, etc.). If they wanted to color them when they got home, they totally could. Building with the squares is a great STEM activity. 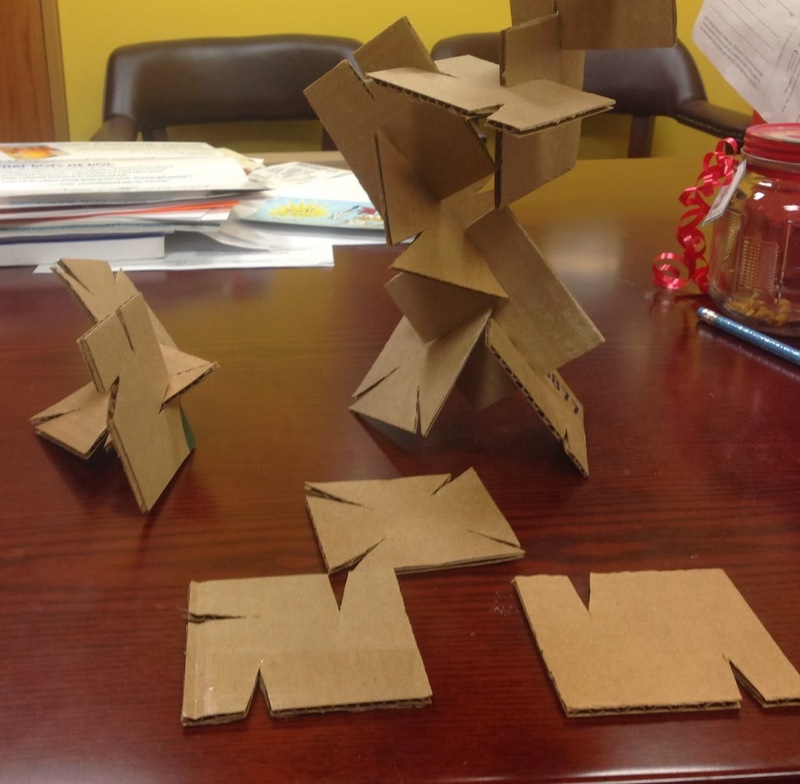 Encourage kids to design a structure that will stand on the table. See how high they can build it with a limited number of pieces. Can they redesign it to make it higher? How sturdy is their structure? Can they knock it down with their breath? How could they make it sturdier? Encourage them to experiment with their designs and see what happens. For a family program, provide hundreds of squares and ask everyone to work together to build a GIANT tower! Since they are very cheap and easy to make, building squares would be a great science component to leave out in your children's area. It's easy to replace any pieces that get torn or walk away. And it's great for families to see that you can craft and experiment with materials that do not cost a lot. This was a cheap, easy craft that worked perfectly for a large outreach event!